Chaitophorus capreae apterae are white to yellowish-white (see first picture below). The body is not markedly narrow with the body length 1.8-2.1 times the maximum body width (this characteristic distinguishes Chaitophorus capreae from Chaitophorus horii beuthani which is narrower and occurs on narrow-leaved Salix species). The dorsum and appendages bear numerous capitate hairs (see second picture below). The cauda has a distinctly knobbed apex. The body length of Chaitophorus capreae is 0.8-1.9 mm. Neither the apterae nor the alates have any distinct dark dorsal abdominal markings. 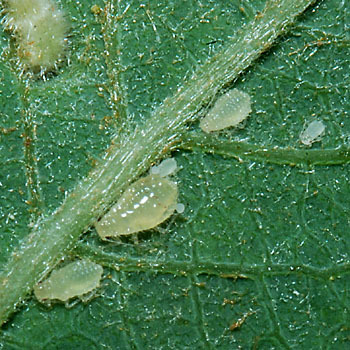 The pale sallow leaf aphid lives mostly on sallows (broad-leaved Salix spp.) especially great sallow (Salix caprea) and grey sallow (Salix cinerea). 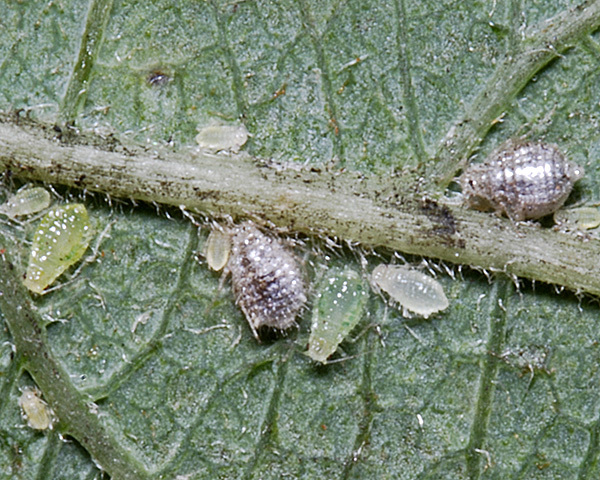 Aphids are usually scattered on the undersides of leaves and are not attended by ants. Oviparae and yellow apterous males occur in October-November. Chaitophorus capreae is widespread in Europe, and eastward to Central Asia. 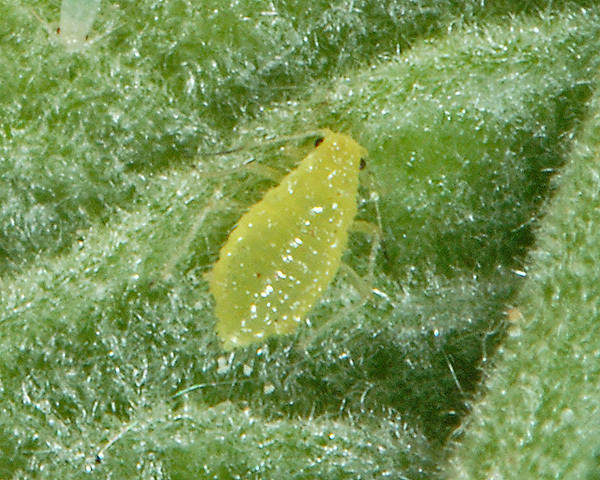 Typically Chaitophorus capreae is found scattered on the undersides of sallow leaves. We have found Chaitophorus capreae in several locations in southern Britain from late April to July, usually in low numbers, as shown in the pictures below. We have however found one very large colony on sallow planted for hedging in a car park. 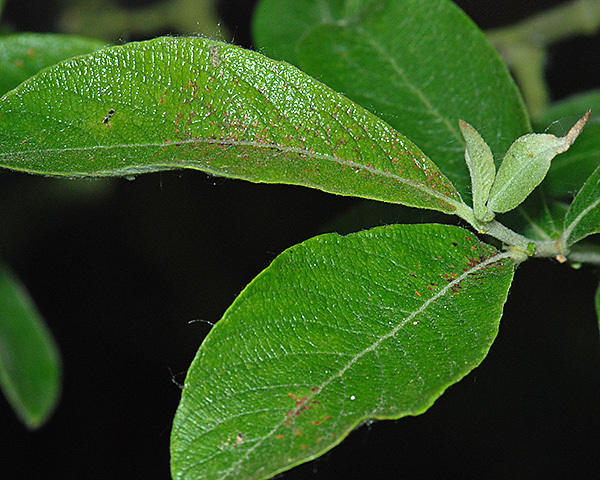 It is not unusual to find aphids, which typically occur in small numbers, occurring in abnormally large numbers when the host plant is cultivated - the same occurs with Myzocallis coryli when hazel is used for hedging. 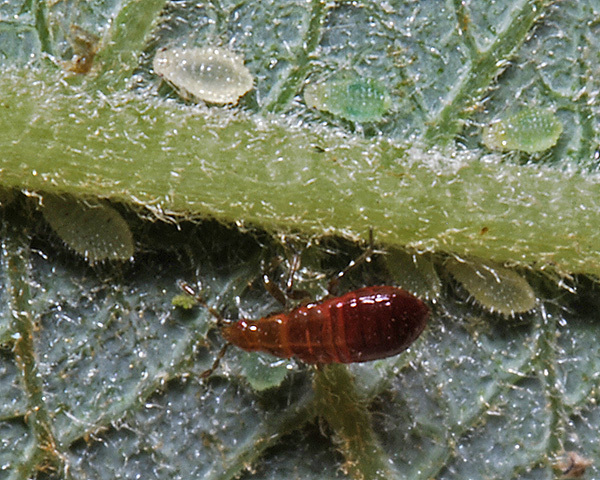 Note that the picture below shows a mixed-species colony because the larger green aphid in the bottom right quadrat is not a Chaitophorus capreae but a Cavariella species. Most of the literature (e.g. Shingleton (2005)) indicates that Chaitophorus capreae is not attended by ants, and we have never found ants in attendance even at the unusually large colony above. We note however that Litschauer (2008) has reported that the species has a mutualistic relationship with ants in Austria. 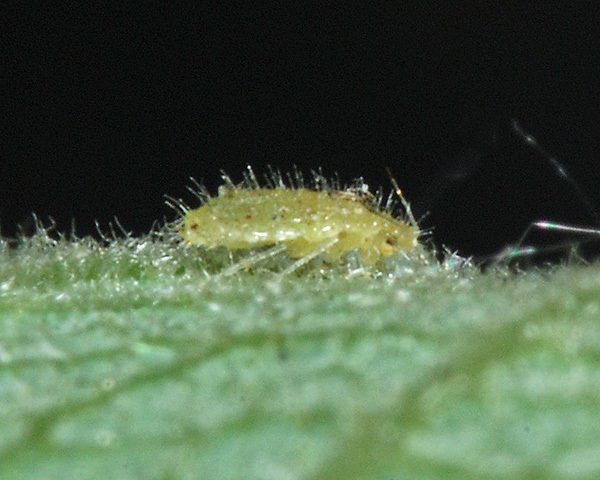 However, this may be a result of misidentification of the aphid. The first picture shows two parasitized mummies together with some live nymphs. The second picture shows a preserved specimen of the adult parasitoid. The wing venation (namely the lack of forewing vein M+m-cu) and the host aphid suggest that the parasitoid is Adialytus salicaphis. This species has been recorded attacking Chaitophorus on broad-leaved sallows in south-eastern Europe by Tomanovic et al. (2006). Adialytus salicaphis was recorded for the first time in Britain by Baker & Broad (2009). 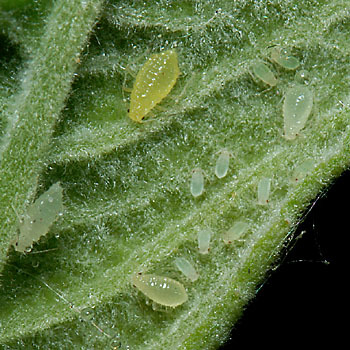 They suggest that it may well be common, but has been overlooked because it does not attack pest aphids. Blackman & Eastop list over 120 species of aphids as feeding on willows (Salix species) worldwide, and provide formal identification keys. Sallow has few uses other than for ornamental purposes, and is considered a weed in some countries. 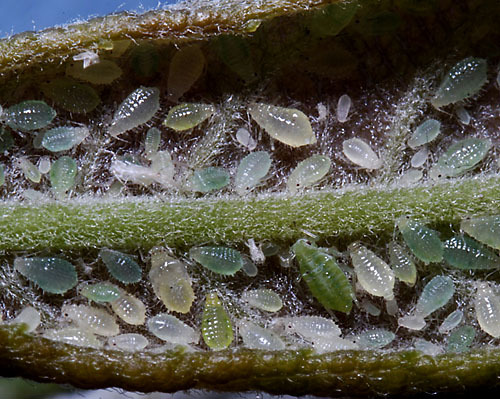 Hence there is seldom any need for control of the aphids. 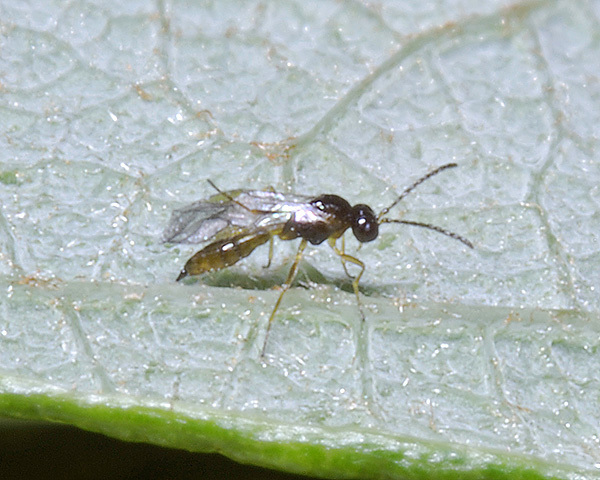 Unlike some other parasitoid species (for example Lysiphlebus fabarum), the parasitoid we have found (Adialytus salicaphis) does not seem to attack crop pest aphids, so Chaitophorus capreae populations would not provide a useful reservoir for parasitoids.